Life Worship are back with an invigorating album of songs that embody the joy and adventure of a life spent in worship. An album of adventure and life, Wide Open Space follows Life Church's exciting journey into discovering God's calling. Following up Dance Again which reached Number 1 on the iTunes Christian & Gospel Chart, Wide Open Spaces hit the ground running, arriving at the top spot within just a couple of hours of release! Matt Hooper, writer of the album's title track, describes Wide Open Space as a 'heart cry to God: "I don't want to leave anything undone on this Earth"'. The possibilities which open up in a life with God are what carries the songs which sing of drawing close to God. If you want to see what exactly inspired the album, look no further than the opening of Romans chapter 5: "We throw open our doors to God and discover at the same moment that he has already thrown open his door to us. We find ourselves standing where we always hoped we might stand-out in the Wide Open Spaces of God's grace and glory, standing tall and shouting our praise." Based in Bradford, Life Worship have filled up recently played lists with their blend of inspired lyrics, joyful praise, and synth driven dance tracks like the new track Love Let Loose which shouts ' Your love, it makes the best in me'. into all I can be. Also, if you head over to Life Worship's website, you can discover chords for the whole album so that you can play along at home, at church, or even outdoors! Wide Open Space CD by Life Worship was published by Integrity in May 2016 and is our 2835th best seller. The ISBN for Wide Open Space CD is 0000768653128. This cd is so uplifting. I play it every day before I leave for work. Thanks to Eden making it possible to hear a little of each track I had a good idea of what is on the cd. Got a question? No problem! Just click here to ask us about Wide Open Space CD. Wide Open Space is a celebration of adventure. A call to the wild edges of God's grace - where impossible things happen. Where we are caught up in the mystery of His will - the end of trying to figure everything out in our heads & step out into the wide open spaces of God's grace. Stepping sacred. But thirsty for adventure. 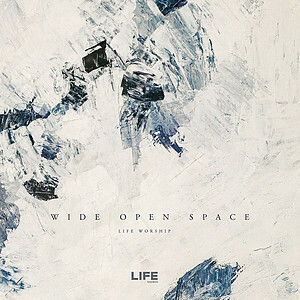 Wide Open Space is the follow up to the charting Life Worship CD Dance Again, which included the global worship song "We Believe". The worship ministry of Life Church exists to see people encounter God through worship. As a church to they are committed to seeing people find Jesus and live the life that God has planned for them. The worship ministry of the church is such a key part to this and many of the songs here represent the stories and journeys that they have encountered as a congregation. Now Playing: Wide Open Space Your browser does not support the audio element.